Gramsci argued that ‘democracy, by definition, cannot mean merely that an unskilled worker can become skilled. It must mean that every ‘citizen’ can ‘govern’ and that society places them, even if only abstractly, in a general condition to achieve this’. Therefore, he argued that the task for the working class was to become intellectually autonomous, as this was the way for them to lead their own movement and thus, become a ruling class. He relentlessly sought the ways for accomplishing this historical task, among others, in the field of education. His pedagogical program was based on the radical idea that everyone is already ‘cultured’ (without any formal education), just in an ‘undisciplined’ way – as he put it; and the main mission of education was to form intellectuals of the subaltern social groups who will be able to oppose and transform the existing social order – in his terms, ‘organic intellectuals’. Therefore, education is ought to be based on a critical understanding of the participants’ own position in society. That is, pedagogy is not (should not be) about abstract ideas. The working class is not supposed to attain some already existing ‘knowledge’ or stuff their brain with empirical data and raw facts; the true goal of education is the attainment of a higher awareness. The learning process is a road towards self-knowledge and liberation, and this road leads through developing and disciplining already existing knowledge, through a critical understanding of the participants’ situation, their own historical value, their function in life, their rights and their responsibilities. However, pedagogy for Gramsci by no means entails simplification, let alone vulgarization. Intellectual paternalism can only force ‘the reformism of the upper stratum of intellectuals’ upon the workers. Instead, workers have to undergo challenging intellectual exercises from an early age so that they become able to form their own view of the world, their own framework of a conscious way of living for themselves and their class. In only this way can they learn to think critically, which is essential to attain that higher awareness which would ultimately liberate the working class. Moreover, learning is also an opportunity for the worker to escape the precarious life the wage-earner is forced to live and follow a course of study instead, if only momentarily. In this way workers can experience something uplifting, something fruitful, more than itself, a moment of a different world, a world that they can strive for in their own movement. This is a way to learn to see beyond one’s personal interests, ‘exchange ideas, hopes and sufferings’, and in this way be an active participant of the political community. If we take a look at our school systems (almost anywhere in the world), we cannot see much of what Gramsci proposed being exercised in practice. Instead, what we see is an extreme neoliberalization of education on all levels, as well as knowledge production in general. As the state is increasingly withdrawing from financing higher education, the priorities of universities are shifting: activities that produce profit take precedence, which drives collaborations with for-profit companies or research winning EU grants, whose agendas are clearly driven by a neoliberal agenda. As a result, teaching has become a residual activity in the work of professors and critical thinking is increasingly silenced under the guise of positivist principles that suit profit-making better. We may, however, come to look nostalgically on the academic Left, regardless of its disabling preoccupations. Today, that group is rapidly being replaced by academics fortunate enough to secure appointments but too insecure in them to dare to think of combining activism and scholarship. This new generation is not even positioned to freely protest its own plight in the face of the ongoing corporatization of the academy, let alone start to work with ordinary Americans outside the academy who suffer the worst effects of the inequitable neoliberal economy. Confronting growing professional and institutional pressures from performance measurement schemes to publish in “high-impact” journals (i.e., highly cited, not highly influential politically), many academics now must publish constantly; however, their work is often assiduously theoretical and methodically arcane, as well as apolitical and disconnected from ongoing political struggle. Many of these younger academics are of the Left in their hearts and minds, but not on the printed page or in the streets. No doubt neoliberalization is not the only problem with university education. Academia has never really managed to live up to the Gramscian ideal. It is a question whether it has ever tried at all. It has rather been a site of reproducing privilege and social inequalities. However, there is great potential in ‘the university’ to be an integral and active part in social change due to the immense resources accumulated in it: dedicated faculty, infrastructure, money, and first and foremost, a great many students who are not yet co-opted by the structures of injustice and willing to get their hands dirty in the daily struggles of resistance. But as a result of the neoliberal organization of today’s universities, these resources are allocated and used in a way that is not conducive to pursuing emancipatory activities. The many well-meaning people in academia who would want to take political action and partake in social movements do not, or cannot do so, because they are vulnerable to and thus very much constrained by the conditions of its increasingly neoliberal set-up. When I started studying for my PhD, I had high hopes of what kind of subversive work I would be capable of pursuing as an academic due to the title I would earn and the resources as well as intellectual and existential freedoms that come with it. But today, I am deeply disappointed by the neoliberal configuration of academia that approximates any transnational corporation: all-time availability (including evenings and weekends) is a basic expectation from faculty, resources are too often focused on PR, business relations, and the work of departments that can produce revenues (in the form of research funding). One way of resisting these tendencies is to build alternative structures. The fact that we see a burgeoning of such initiatives – the Freedom University in Georgia, US, the Underground Scholars’ Initiative all over the US, and PUKAR in India, to name but a few – is just another reminder that struggle for progressive, subversive education is alive. Below I share an example of such alternatives from eastern Europe: the School of Public Life in Budapest, Hungary. The school materialized very organically. With a fellow activist from a Budapest-based grassroots organization, The City Is for All, we realized that most of what we had been doing in the group , partly consciously, partly unconsciously, was political education. This was our own political education, as well as that of the group’s homeless members. Early on, whenever we held a training on a topic important for the group (such as legal matters, communication, civil disobedience), we noticed that members were very eager for this knowledge – knowledge relevant to them at last; and that they also enjoyed gaining a deeper understanding of their own position in society, and how they ended up in that position. Some members who had had higher levels of education appreciated the fact that they could ‘use their brain again’, as they put it. Much less importantly, we also enjoyed these activities a lot, we felt that all the critical knowledge we had gained at university was finally being used for what it was meant for. However, we also realized that all the forums that used to be there for lower class people to gain such knowledge – such as the workers’ movement and unions – had ceased to exist or ceased to provide this kind of education any longer. We decided that we would establish an organization to fill in this gap. The School of Public Life is a registered NGO that provides political education for marginalized members of Hungarian society – people facing poverty, Roma people, women, people with disabilities, and LGBT people, among others. The content of our educational practice is based on our experiences and training in critical theory and grassroots organizing, and its form is grounded in the concept of critical pedagogy. This is not a particular educational method, but rather, a coherent educational philosophy based on the work of Marxist Brazilian educator and theorist, Paulo Freire. Our principles are also very much inspired by the ideas of Gramsci discussed above. This educational philosophy anchored in critical social theory, by definition takes into account hierarchical social relations, and relations of oppression in particular. From this view, any critical pedagogy project should reflect on the social relations in which participants live and interrogate the ways in which these relations should be changed in order to increase social justice. As a result, critical pedagogy is primarily aimed at individuals who experience social marginality (in any form) and their communities. 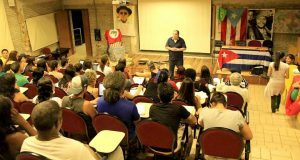 Our core activity is organizing training courses in which participants can gain a clearer understanding of the socio-political structures that reproduce oppression and injustice. 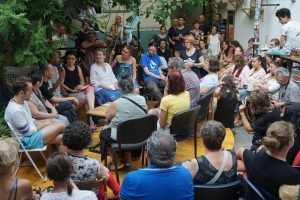 We run courses such as Social Inequalities and Civil Rights in prison facilities, Gender-Based Injustices, and Social Movements in different community centers in Budapest, and also our own training course on Critical Pedagogy. In addition to these more theory-based (but by no means theoretical) courses, we hold workshops where participants develop skills and tools in how to fight this oppression in practice. These include: Grassroots Organizing, Advocacy in Base Building, Moderation of Discussions, or Media in Advocacy. As part of this educational program, we also publish literature related to our mission and activities (reading materials, text-books, paperbacks, etc. We produce political, as well as academic texts as reading material for our courses to make them accessible for participants with lower levels of formal education. Making them accessible is a work of translation, often from Hungarian to Hungarian. We also create our own teaching materials when there is a lack in available literature. We use academic, as well as popular political texts (blog entries, book chapters, newspaper and magazine articles) that describe, analyze and explain the ways in which social injustices are reproduced. For example, in the textbook we put together for the Social Inequalities course we hold in prison facilities, we selected texts by Iris-Marion Young, Loïc Wacquant, Amartya Sen, Pierre Bourdieu, as well as Hungarian researchers and less recognized activists and organizers such as Gábor Kézdi, Gábor Kertesi, Tünde Virág, Csaba Dupcsik, János Köllő and sometimes our own work as well (Tessza Udvarhelyi and Mariann Dósa). In addition, we produce progressive, empowering publications targeting the broader public on social movements, activism and progressive politics. In 2015, we published a book about activists with first-hand experience of social marginality, which was followed by our book about mothers engaged in political work. Housing poverty and (missing) housing po ..
We also do participatory action research (PAR). 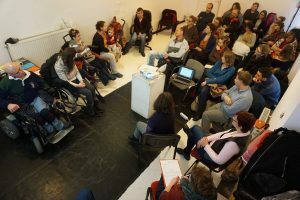 We pursue our own PAR projects (so far one on Hungarian housing movements and one on independent living with physical disability), but we also organize public events and workshops to inform the broader public – academics, as well as activists and organizers – about this research approach and encourage the implementation of such research projects in Hungary (or wherever). PAR is based on the right to research, a concept of Arjun Appadurai, that aims to democratize research and open up the possibility of knowledge production outside academia, especially among marginalized social groups. Knowledge is not an aesthetic good that is supposed to be produced for its own sake. Knowledge is of worth only if it serves social progress. Therefore, both its production and “consumption” should be as widely accessible as possible. In PAR projects, the individuals who research an issue (co-researchers) are directly affected by this issue, that is, they have first-hand experiences of oppression, granting them a particular perspective and expertise on it, and also shifting the motivation for and the stakes in pursuing the research. They engage in research because they need the knowledge they produce – they want to use it for analyzing their socio-political context and taking steps to bring about change in this context, and hence, their own lives. In PAR, research is a means of social change, of change coming from below, not the manifestation of the curious gaze of elite groups. 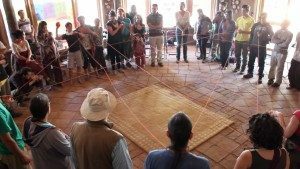 Not only are power relations shifted in participatory action research, but also co-researchers go through fundamental change – they learn to look at themselves as full citizens (again), as human beings of equal worth to others. This emancipatory potential is invaluable. It is a thread of hope. Schram, Sanford F. 2015. The Return of Ordinary Capitalism: Neoliberalism, Precarity, Occupy. Oxford: OUP. Mariann Dósa is an activist-academic, with a mixed social sciences background. She completed her PhD in Social Policy, currently she is the coordinator of education programs of the School of Public Life, a political education and research center in Budapest, Hungary. She has been active in the Hungarian feminist movement and member of the grassroots housing organization, The City is for All in the past ten years. Her areas of interest are political sociology, political inequalities, and feminist thought and practice.